Over the years Muvtons has garnered immense loyalty and respect from its customers around the globe for being a Solution Provider. We care for each of our customers and strive to provide them with valuable mobility solutions. We have gained the reputation of delving deep into applications to provide the right 'solution' and this is what the Muvtons experience is all about. Muvtons conceives, engineers, develops and manufactures the most wide-ranging and all embracing range of heavy and extra heavy duty wheels and Castors. The company has invested in the best possible human and physical capital to create state-of-the-art facilities and has developed world-class capacities and capabilities. As a result, we are today regarded as one of the best heavy-duty Castors companies worldwide. 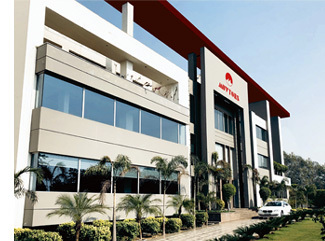 Products are manufactured in our fully integrated plants at Noida, just outside of New Delhi, that comprise of the latest in technology ranging from CAD-CAM systems to CNC Machining, Robotic Welding and Computerized Polyurethane Casting Plant ensuring zero defect Wheels & Castors that last a life time. Because we rely purely on our own resources, our customers can rely on us. Every finished wheel and Castors is individually inspected before it is allowed out of the plant. Products are randomly selected and subjected to internal dynamic testing. The vast in-house design & manufacturing capabilities allow us to meet special demands in very short times. Our design engineers with extensive knowledge of the Castors industry provide complete solutions to your material movement needs. Our network is spread across the globe with distributors in all major parts of the world. Our representatives can visit you for an application study and recommend a long lasting solution. This helps us reinforce our goal of short lead times and personal attention to the customer.